Is there ever such thing as too much hardwood furniture in a room? After all, it's beautiful, it's natural, and it's durable enough to last for generations. What better material to use for furnishing your home! If hardwood furniture presents any interior design challenges at all, it's the fact that combining several matching pieces into one room can cause the room to look somewhat monotonous, especially if you also have hardwood cabinets, interior doors, floors, or trim. Suddenly your beautiful furniture can become lost in a one-dimensional world of brown. The best way to avoid this from happening—or to remedy it if it has already happened to you—is to decorate in a way that brings out the best in your hardwood furniture and distinguishes it from the other elements in the room. Add area rugs. Area rugs work especially well on hardwood or laminate floors to add dimension to a room and to set the tone of wood furniture apart from the tone of the floor. Without an area rug, there's nothing to differentiate the pieces from one another—or from the floor, if it's a similar tone. Even on low-pile carpet, area rugs can add dimension and varying texture and color to your room. They not only give a softer look to wood furniture, but if sized properly, serve as a visual frame, allowing your furniture to become a focal point. Mix different textures, colors, and patterns. When you introduce new textures, colors, or patterns in a room, you create visual layers that add greater dimension to the room. If done in moderation, this can further accentuate the beauty of your hardwood furniture. While area rugs are one way to introduce a new visual layer, there are additional ways to accomplish this. Adding curtains or drapes, lampshades, wall art, or décor such as a vase of colorful flowers or greenery, can also create visual depth that complements the wood. Combine wood with upholstery. If you love the look of hardwood but desire a softer feel for your furniture, a mix of wood and upholstery could be a welcome compromise. Adding upholstered seat cushions to dining room chairs or choosing a bed with an upholstered headboard are a couple ways to feature the varying textures in a way that still puts the emphasis on the natural beauty of hardwood. Add an accent wall. In a room full of matching hardwood furniture, a single contrasting accent wall can also help add dimension. Accent walls featuring wallpaper, brick, stone, contrasting wood planks, wainscoting, or white or gray shiplap can contrast beautifully with the texture of wood furniture. The accent wall and any pieces of furniture against it become a focal unit, distinguishing that furniture from other matching pieces in the room. Mix different wood finishes. Two-toned furniture is another excellent way to address the design challenge presented when several pieces of matching hardwood furniture reside in the same room. For example, a dining chair top and seats could be a lighter finish, and the table apron, base, and chair frames a darker finish—or vice versa. Additional pieces could either be a solid tone or two-toned. Tones could also vary by piece. 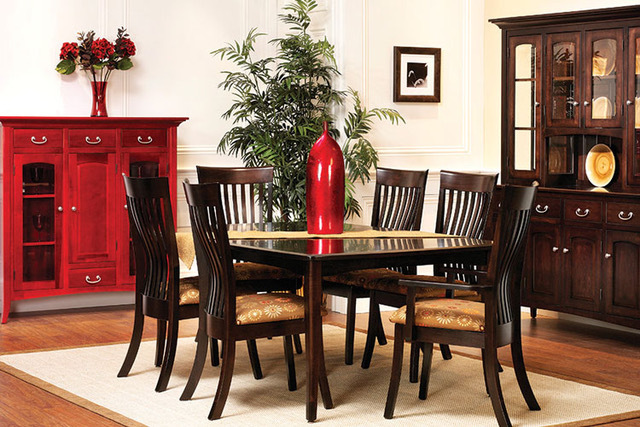 The dining table, chairs, and sideboard could be one finish, while an accent piece such as a hutch or china cabinet could be a contrasting finish. Even with the design challenge of adding dimension to matching wood furniture, hardwood is still the best choice of material, and will be beautiful and durable regardless. But with a few well-planned accents, you can help your hardwood furniture stand apart in any room.